– Creatine is popular amongst bodybuilders, professional athletes and anyone wanting to increase their muscle strength and muscle mass quickly. – Creatine use consists of a loading phase and a maintenance phase. During the loading phase, the ideal micronized creatine dose is twenty grams a day, broken into four times of taking five grams each time. The maintenance phase involved cutting the dosing requirement in half, to two five gram doses a day. – To get the best results, mix creatine monohydrate powder with fruit juice to get insulin levels up and shuttle the creatine straight to the muscles. – Studies show that subjects who used pure creatine monohydrate during workouts experienced increased muscular contraction, aiding in increased muscle building. 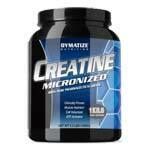 – Creatine increases the body’s ATP, improving stamina and performance. – Creatine monohydrate side effects may include stomach upset, gas and water retention. These side effects are usually only temporary, lasting only during the loading phase, and may be relieved by lowering the creatine dose. If you want to increase your strength, add muscle mass to your body, improve your endurance and get the most out of your workouts, you should consider creatine monohydrate powder. Of course, as with any supplement, check with your physician first to see that creatine is right for you.